"I started thinking about latrines and hygiene behaviour when many of the children in this village were getting sick. 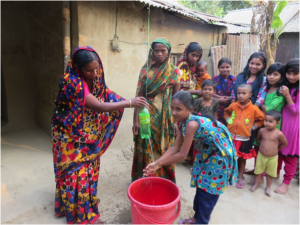 I realised that by using sanitary latrines and ensuring proper hand washing we could reduce many diseases," said Rahima Khatun, the president of the Community Based Organisation (CBO) Joytetul Ramkrishnabri. Rahima has been involved in social works in her community for 17 years, and her CBO is now working with more than 1100 households in three villages. The CBO is one of Habitat for Humanity’s community change agent partners under the CS WASH Fund. Through the project, the CBO is providing loans to build improved latrines, as many households have basic pit latrines in very poor condition. In late January, Joytetul was the first village to be declared open defecation free (ODF) under the project. Following a CLTS process which encouraged families to install new latrines and upgrade existing poor condition latrines, 11 families installed new sanitary latrines through the loan program, 14 built new latrines with their own resources, and 65 upgraded their latrines to be more hygienic. Rahima says, "I always shared the message to live a healthy life and I think that hand washing and using a hygienic latrine is one of the most important things for a family." She visits the families in her community and helps families to install tippy taps, and encourages them to upgrade their latrines. "I feel honoured when people approach me to ask for hygiene suggestions. I love volunteering for my community. I believe that results can be achieved when everyone is involved. We all are ready to adopt the changes towards a better life," Rahima says.